Situated on a large, fully fenced, flat section, which backs onto a native bush reserve and catches the all day sun. It is a short walk to Raglan's cafe’s and restaurant’s so you can leave the car at home or, if you don’t want to bring the car, there is a bus stop right outside. Near the end of the street are 2 playgrounds and a safe Harbour beach for the children to swim at high tide or, if you prefer your beach to have waves, the World Class Surf Beaches are a short drive away. Also conveniently located near the end of the street is the Wharf. Here you will find interesting shops like Soul Shoes, Tony Sly Pottery and great coffee. 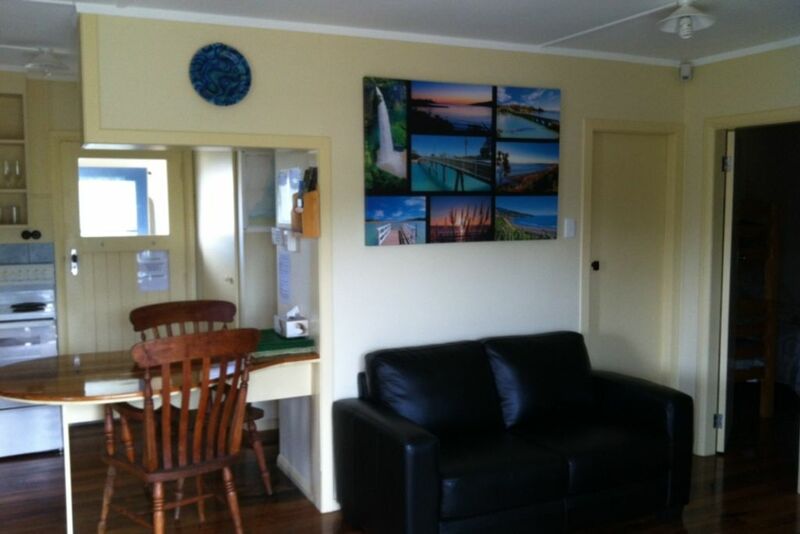 At the Wharf you will also find the best Fish and Chips shop in Raglan where you can sit and eat “your fresh catch” while watching the fishing boats come in. It is here that Orca are often seen hunting stingray in the bay. Another must do in Raglan is the stunning Bridal Veil Falls which is approx 20 minutes drive away and an easy 15 minute walk to the top – Simply Stunning Scenery! Great little place with character. Great little place with character. Had everything we needed and was a good location. We really enjoyed it. We found the bach wonderful for a few day to get away and relax. This is a cosy little house with everything we needed. Great propert, tidy and well furnished. Great propert, tidy and well furnished. Beautiful spot, front deck watching the water and world go by. Would highly recommend this place to stay . We will be back soon I hope . Love Raglan . Great little traditional Kiwi Bach and the location was very nice. Great little traditional Kiwi Bach and the location was very nice. We really enjoyed our stay thank you. Would have found bedside lockers with lamps really useful and somewhere to put soap down in the shower cubicle. Small points and everything great otherwise.